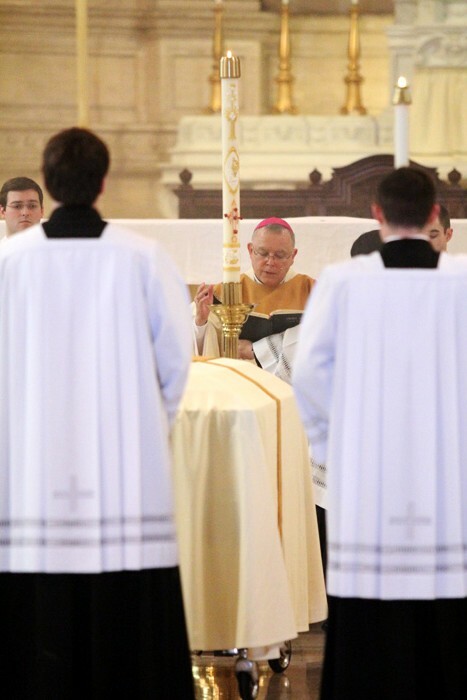 Archbishop Charles Chaput, celebrant of the funeral Mass, prays over the body of Jose Serrano. Jose A. Serrano, II, 39, a first-year theology student at St. Charles Borromeo Seminary, died March 24 following an extended battle with cancer. The son of Jose and Sara (Ramos) Serrano, he attended St. Veronica School in Philadelphia, Roman Catholic High School and Temple University where he earned a degree in archaeology. He was also a long-time member of the Marine Corps Reserve, a licensed pilot and an avid fisherman. Although he worked as an archaeologist at sites around the country, prior to entrance into St. Charles in 2009 he worked for the City of Philadelphia as a water treatment plant manager. As a child Jose was always running around, Sara Serrano recalls. “He was interested in trains, bells, airplanes, machines. He was mischievous and a loving son,” she said. A calling to the priesthood was something Jose considered as a teen, Sara Serrano said, but he put it aside. In recent years he was living in Maternity B.V.M. Parish in Philadelphia, where he was an extraordinary minister of the Eucharistic, but was feeling restless, she recalls. She gave him the Chaplet of Divine Mercy and urged him to pray it. A few months later he told her he had decided to enter the seminary. When as a seminarian he developed a serious cancer it was a shock, because he was always fit; he didn’t smoke or drink and ran regularly, his mother said. 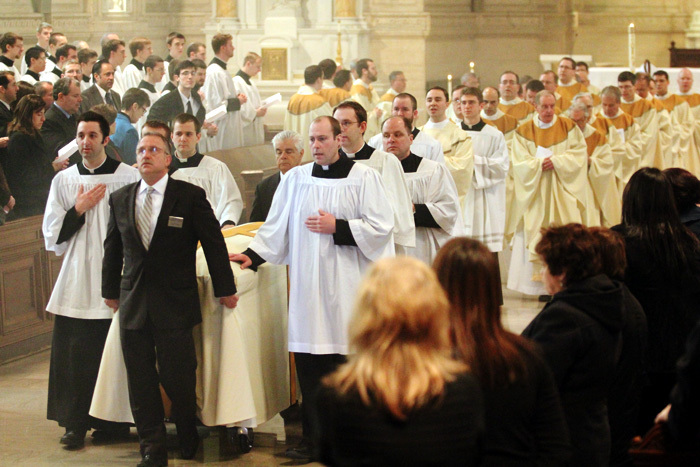 Father Joseph Gleason who is director of the Theology Division at St. Charles, was the homilist at Jose Serrano’s funeral Mass. He recalls what an excellent attitude he had all through his illness, his great love for his family, and also his great love for the Eucharist. “It meant a lot to him when we took it to him,” Father Gleason said. Jose’s family walks out of St. Martin’s Chapel at the seminary after Mass. At the end, Serrano was in hospice surrounded by his extended family, including his beloved grandmother, Maria Ramos. They were all praying the Chaplet of Divine Mercy when he died. “That is what he would have wanted,” his mother said. Archbishop Charles J. Chaput was principal celebrant of Jose Serrano’s funeral Mass March 27 at St. Charles Seminary. In addition to his parents and grandmother, he is survived by his brother Francisco, his sister Rebecca Rodriguez (Angel), four nephews and a niece. Interment was at Holy Sepulchre Cemetery, Philadelphia. PREVIOUS: Sister Mary Elaine Joyce, I.H.M. 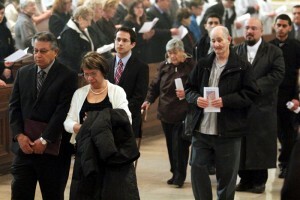 On this Christmas eve while looking for another article I came upon this memorable article about my son Jose’s funeral. I see it as yet another blessing that Jose is with us during this Christmas season. I love you Jose (Chelo, as we lovingly called him). We miss you and will love you forever.